My flight got into Lexington pretty late on Friday night, just before 11:30pm, so I knew I wasn't going to get much sleep before my Saturday morning race. 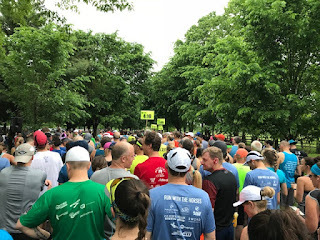 At 7am, I would begin yet another 26.2 mile run, but this time I'd be checking off Kentucky as my 45th marathon state at the 4th running of the Horse Capital Marathon. 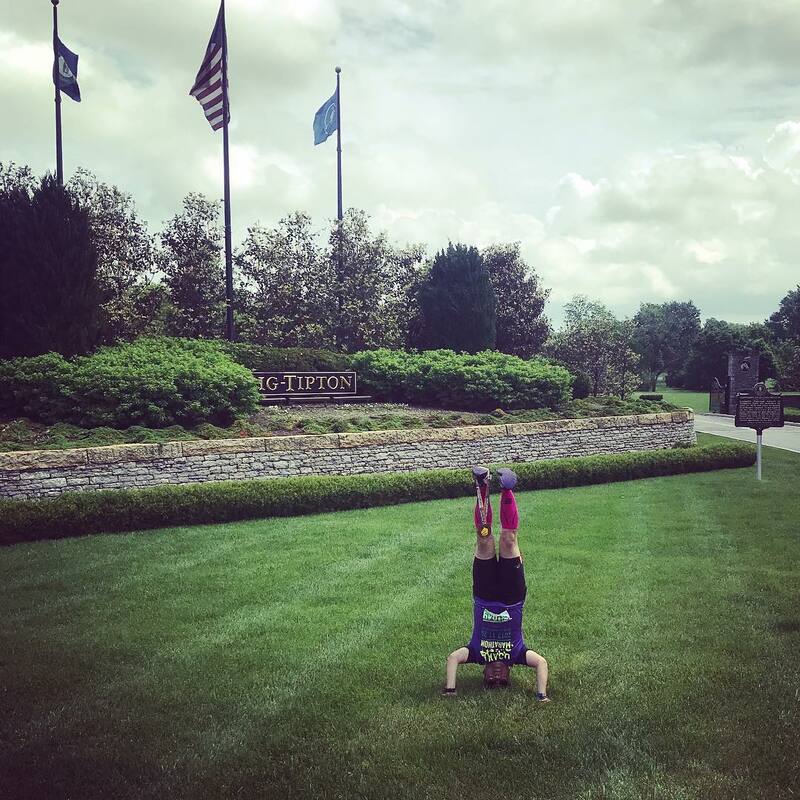 The start and finish were held at Fasig-Tipton, a thoroughbred auction house founded in 1898, and the oldest of its kind in North America. Originally headquartered at Madison Square Garden in NYC, its current permanent headquarters have been in Lexington since 1972. After roughly 5 hours of sleep, I was out the door before 6am, and drove the ten minutes over to Fasig-Tipton to get my bib and meet with the race director, Bob Baney, for the first time. We had gotten in touch late last year after our mutual friend Erin connected us when I was seeking out a marathon to sing the national anthem at for the state of Kentucky. Before the lot of us headed over to the startline, I got to join in on a few photos with friends, including Jascia, pacing 2:45 for the half, and who I hadn't seen in quite some time; and of course, Erin and her husband Mikie! After a few announcements from the DJ and emcee Bill Bryant from the WKYT, the local CBS affiliate, who also acknowledged Joe Zambrano (aka "Fireman Joe") running in full fireman's uniform, it was my turn up to the mic, as I checked off state #47 in my national anthem quest! 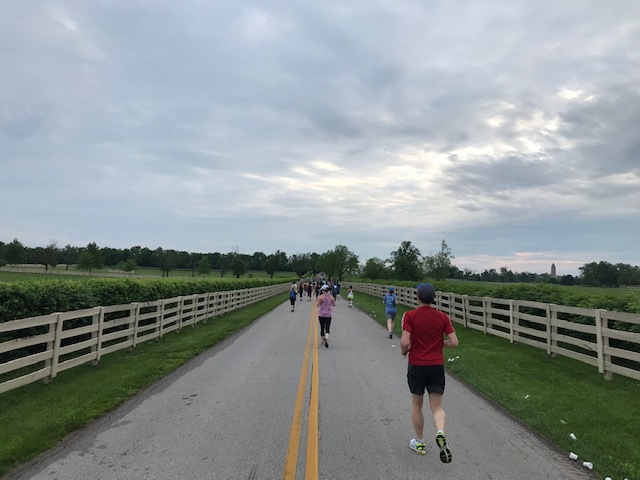 We were off and running under overcast skies, at a temperature of 66º and 88% humidity and rising. All week, the forecast said thunderstorms throughout the day for the area, and the grey clouds loomed overhead. At 7am, they were in the distance, with the sun even peeking through at times. At least, for the start everything was good. 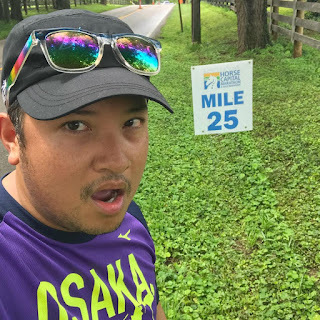 We ran out through the main gates of Fasig-Tipton, turning right onto Newtown Pike, rolling along the mild hills up until the right turn onto Iron Works Pike and the two mile mark. 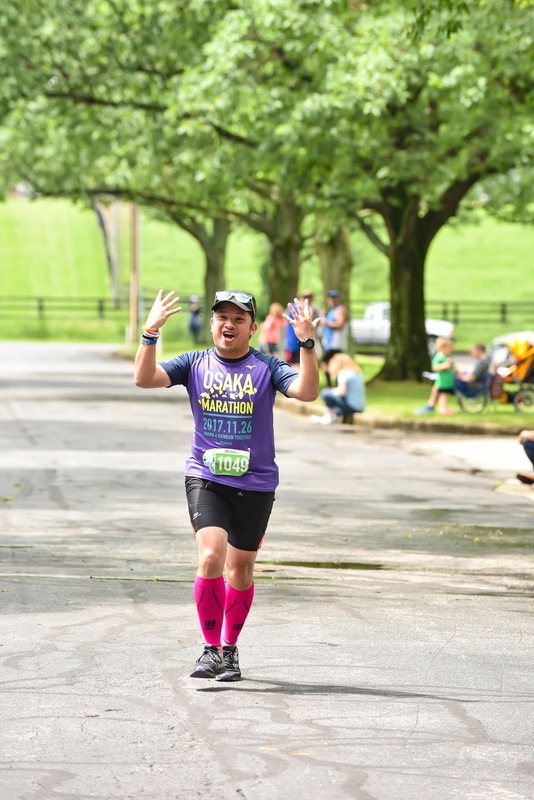 My ankles were giving me issues early, but they subsided as the race went along. Our run on Iron Works Pike was short-lived, before we made a left turn onto Mt. Horeb Pike next to the Mt. Horeb Presbyterian Church, as well as a disgruntled woman who was not thrilled to be held up by a road race as she was towing a horse trailer behind her. The scenery also changed, as we began to run on these rural country roads, lined by beautiful massive oak tree canopies and acres of horse farms on both sides. We continued along Mt. Horeb Pike for a decent stretch of nearly 3 miles, crossing a stone bridge over North Elkhorn Creek, and past a small lake, before seeing a right turn onto a steep descent along Old Lemons Mill Road. Before the right turn, however, I spotted Mikie, so I grabbed a quick selfie with our famous "Where are my strippers?" sign that's seen the entire country! Here's where the true hilliness of the race really began. The steep descent was short-lived because barely a few hundred feet in front of us, the road began to go uphill. It rolled up and down over the next 1.6 miles, along the way being able to see horses on their morning runs in the distance and some inquisitive and coming right up to the fence watching us runners along the road, as well as some vocal dogs barking at us (one I thought was a corgi, but couldn't tell because it was barking in the wrong direction... such corgi like behavior!) until we reached an aid station and a right turn onto Huffman Mill Pike. Will it or will it not rain? 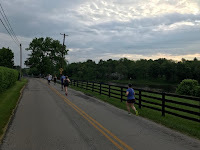 It was along Huffman Mill Pike that Dale, the 4:55 pacer, had caught up to me. 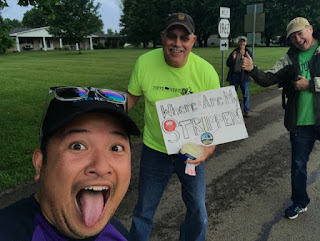 Dale is an active Marathon Maniac and 50 States Marathon Club member, and despite having run a couple of the same races recently (including Carmel this year and Detroit last year), this was our first time meeting officially. 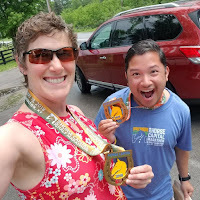 We ran together for the next couple miles as he advised that this stretch would be slightly uphill, and that there would be no aid stations along Iron Works Pike between miles 10 and 13. 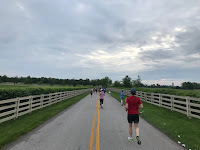 At one point, I also met a couple from Columbus running with their baby in a running stroller, who seemed to be enjoying the morning (the baby, in particular). 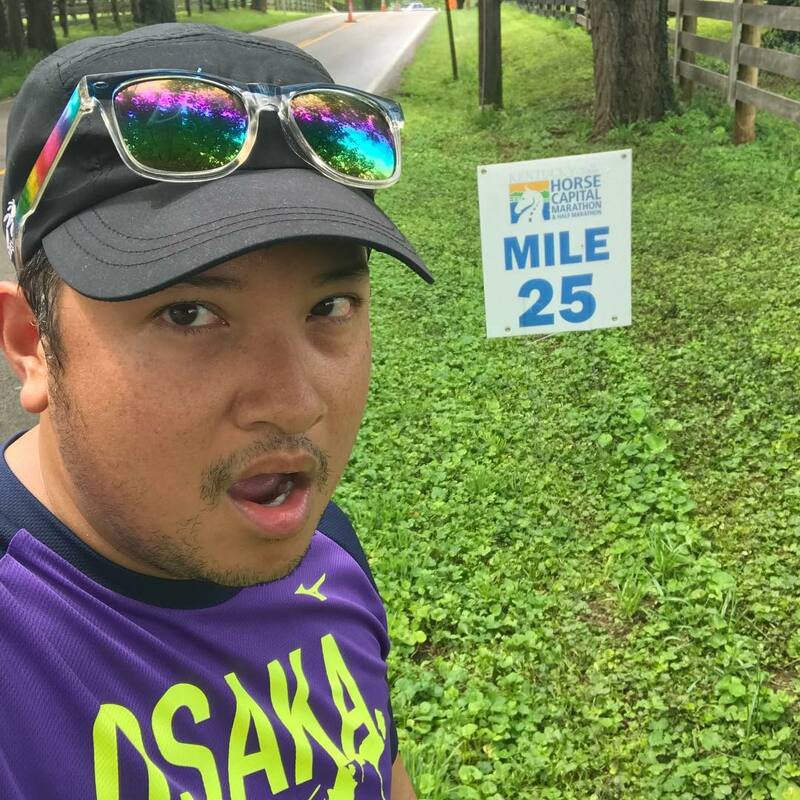 Around mile 9, I decided to take off a little quicker to bank some time to try and see how much I could stay ahead of Dale, and it was also around this time that the skies decided to open up, and the rain began to fall. It wasn't incredibly heavy, but it was actually quite refreshing, having the rain come down for the next 25 minutes. Huffman Mill Pike curved to a near 90 degree angle as we ran past a historical marker for Maddoxtown, noting one of the many freetowns in central Kentucky, settled by former slaves during the post-Civil War period. We reached the aid station at the firehouse, as I gulped up a couple cups of water, before continuing on, knowing that the turn off for marathoners was not too far ahead. We turned onto Russell Cave Road, and then ran downhill along a half mile stretch of it. Just after the Russell Cave Elementary School, the marathoners turned right while the half marathoners continued forward at mile 10.3. We were now on the stretch of Iron Works Pike, and for some time, there was quite a distance between runners in front of me and behind me. 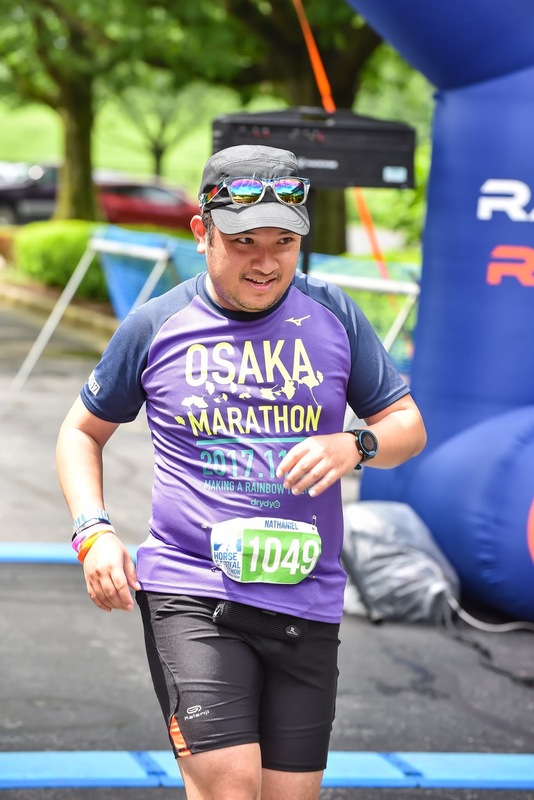 I ended up recording one of my fastest miles of the race at the 11 mile mark, as we ran through the precipitation. 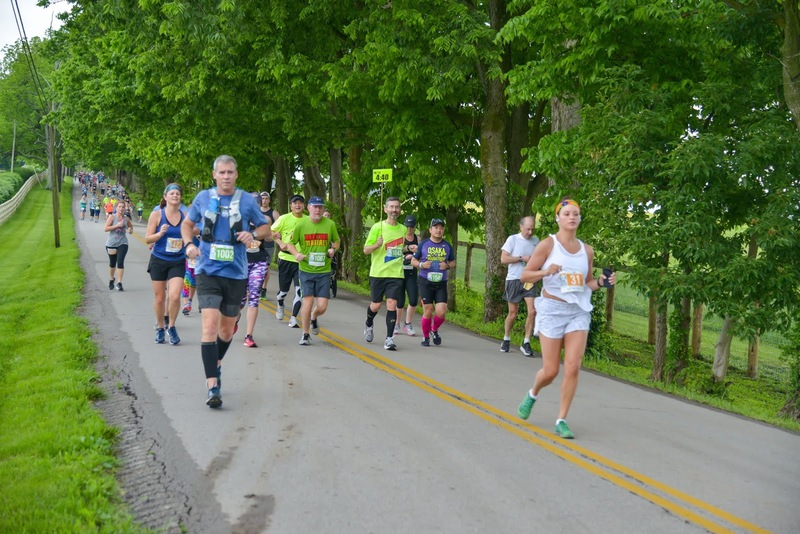 I, of course, was still worried for thunderstorms - there aren't many marathons in the state of Kentucky, and if the course would get black flagged due to weather, it could very well impact my schedule to complete my 50 states by November. 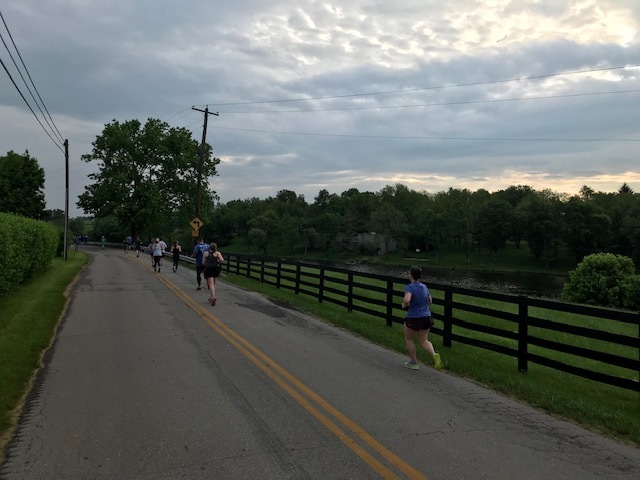 The rain died down not long after, and I had picked up a little speed, I caught up to a couple runners, a marathoner from the San Francisco area and one running her first marathon who lived here in Lexington. We chatted with each other while keeping up a good pace, eventually turning right back onto Mt. Horeb Pike, where we were going to officially begin our "second" loop of the course. I hit the halfway point just after the aid station next to the Mt. Horeb Presbyterian Church, finishing the first loop in about 2:26. The rain had stopped, and the sun began to peek out ever so slightly in the next couple of miles. 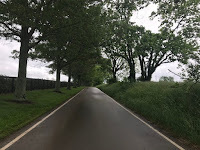 We continued along the rolling hills, making a right turn at the 15.5 mile spot on Old Lemons Mill Road, where we encountered the abrupt downhill for the second time. This rolling hilly section seemed a bit harder as I slowed down somewhat, and began to realize that Dale was not far behind me. 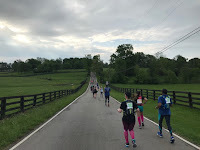 The hills definitely took advantage of me, and I slowed down as we passed the aid station just after the 17 mile junction. In the first loop, we were turning here just after the 6.5 mile mark, but now we were directed to head straight for a turnaround point roughly 1.5 miles away. 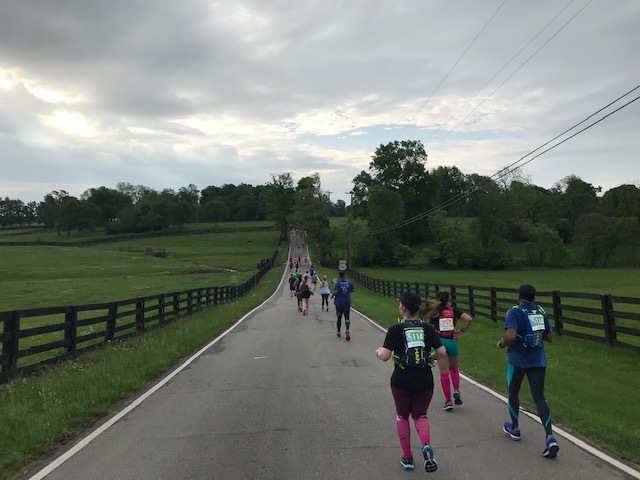 This out-and-back along Old Lemons Mill Road up to its intersection with Russell Cave Road, proved to be one of the toughest parts of the whole race; the hills seemed more pronounced and didn't let up at all. The sky seemed to finally clear at this point, too, and as such, the temperatures began to rise. Along the way out, I found a perfectly dead, and still whole squirrel that had been spared by car tires. I made sure to check it out a little closer on my way back. I found myself walking quite a bit of this section up until we got back to the aid station, now at the 19.5 mile point. We finally got to turn, and head down Huffman Mill Pike. I encountered another stunning bird of prey - a turkey vulture, sunning istelf on a fencepost. 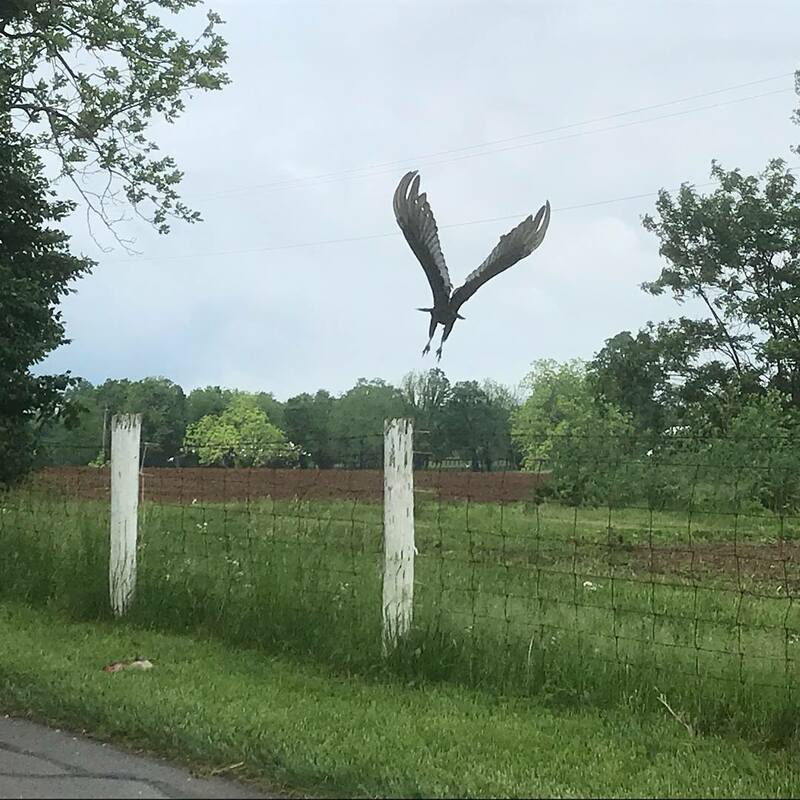 As I ran by, the turkey vulture got spooked and flew away, and I realized I interrupted his (her?) lunch... a fully dead opposum was lying discarded in the grass near where the bird was. The sun was definitely out and in full force, and I was not prepared. The last 10K of the race, despite the tree shade, was pretty open to the elements, and I struggled as I marched lonely through the countryside, with a couple runners within eyesight of me, and Dale and the two ladies way out in front, likely 5-7 minutes ahead of me by that point. As the mile markers rolled by, so did the hills, yet I toughed it out as the temperatures began to rise. The road turned right past the Maddoxtown historical marker, and the runner behind me had caught up, but the one directly in front of me had slowed down as I passed him. After quickly gulping down some water, I knew a downhill was ahead, and I powered on forward, turning right onto Russell Cave Road. This was the home stretch, with only 3 miles left to go of the race. The sun pummeled us. Figuring I had some where between 35 and 45 minutes left in my race, I surged ahead as we passed the intersection where the marathoners had turned some 13 miles ago. But from there on, as we ran along Russell Cave Road, I struggled. The road's hills rolled gradually, definitely not as hard as in earlier miles, but my legs were definitely feeling exhausted. Orange cones lined the middle of the street as regular traffic came up on the other side of the road. Only a couple times did cars pass us as we hugged the shoulder. There came a point where I was just counting cones to run toward before I would measure a quick walk break. It was actually quite a long stretch - roughly two miles - before we saw our next aid station, which was when we turned off of the road just after the 25 mile mark through the entrance of the Ashwood Training Center, an equine training facility adjoining Fasig-Tipton and containing a fairly large dirt track. The rain that had come through the area muddied up the road a bit, so we had to dodge some puddles as we continued forward past the track and around to Fasig-Tipton's "back" entrance. We had a fairly long stretch as we passed the stables, and it was still pretty lonely out there - no one was out cheering. Finally, the turn was up ahead, and then we could hear the music. I crossed the finish line in 5:14:33, thrilled to be able to check off my 45th state. Erin and Mikie were there to cheer me in and take some finish photos as I crossed the mats. I was EXHAUSTED by the time I finished, and needed to sit in some shade and get some hydration in. Erin grabbed me some goetta burgers (the filling being a patty composed of ground meat, oats, and spices, popular in the region), which I would later scarf down, and after about ten minutes, I was ready to go. 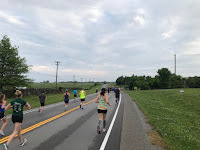 We dodged a bullet and the weather didn't manage to mess up my race, but I was shown a radar that had a fairly large storm cell headed directly for Lexington about an hour later. Erin and I made plans to meet up for lunch, and after Mikie helped me take my headstand photo, I headed back to my Airbnb to take a much needed shower. And just in time, too, as the rain began to come down with a vengeance as soon as I walked in the door. Soaked by rain and sweat, but finished. Celebrating with Erin for lunch! After calling Delta to arrange for confirming onto a later flight on Sunday, I showered and then headed out the door to meet Erin at Wallace Station, a popular restaurant outside of Lexington that was featured on the Food Network's "Diners, Drive Ins and Dives." However, the rain had not let up, and I drove white knuckled through a torrential downpour out into the country. Finally making it out of the rain (and the clouds behind me), I got to the restaurant, which seemed to be a fairly popular stop for folks - there was a line out the door! Erin and I each split a sandwich, one of them being a "Hot Brown," an open faced turkey and bacon sandwich, covered in cheddar Mornay sauce. Of course, the weather wasn't done yet - while we were outside sitting to eat, the rain decided to come down again. It was shortlived, and the clouds went away yet again. Erin and I separated as she had to head back home, a 1.5 hour drive to Shepherdsville. 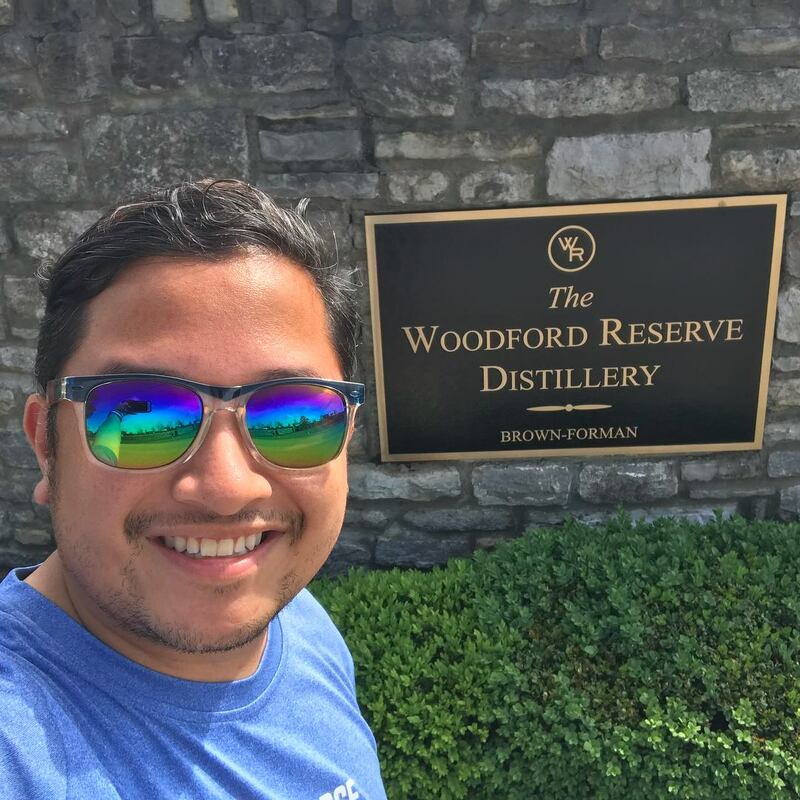 I, on the other hand, was notably close to the Woodford Reserve Distillery, so I decided to make the drive over to Versailles to check it out. Apparently, I was lucking out yet again, as I arrived at the distillery JUST as the last tour was going out. 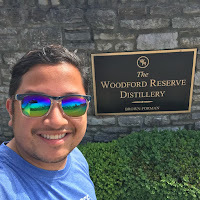 I grabbed a spot on the tour, and spent the next hour touring the distillery's facilities, explaining the history of bourbon and its production process, and much more. 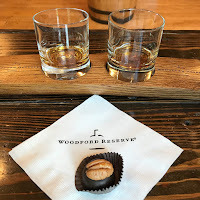 The tour ended in a beautiful rustic tasting room, where we were given a guided tasting of the straight bourbon and the double oaked whiskey, as well as their signature chocolate bourbon balls. With the afternoon headed to a close, I headed back into Lexington to hit up one of the several craft breweries located in town. And it just so happened that this weekend marked the tail end of the Lexington Craft Beer Week. 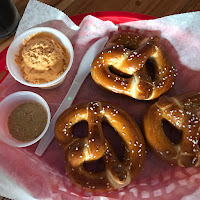 At Blue Stallion, I enjoyed a delicious Peanut Butter Porter, lovingly called "Ya Damn Skippy," accompanied by Bavarian pretzels with smoked lager beer cheese and German Pilsner spicy mustard. The place was also getting pretty busy into the evening hours! Exhausted from all the events of the day, I headed back to my Airbnb to get some much needed sleep, and to rest up for another busy day ahead. With Kentucky Derby winner, Orb! 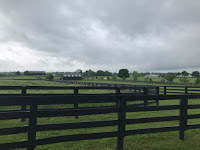 The following morning, I woke up at 8am to get myself packed and out the door by 9 to drive the half hour out to Paris, Kentucky, where I was scheduled to go on a guided tour of Claiborne Farm, a thoroughbred horse breeding farm and stable. 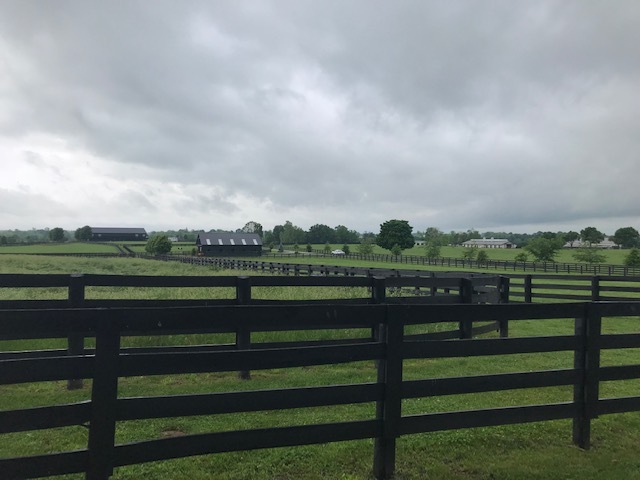 Over 100 years old, the farm is one of the most well known horse farms in the world, with over 500 horses on its 3,000 acres. Claiborne stallions and their progeny are responsible for 22 Kentucky Derby winners, 19 Preakness Stakes winners, 22 Belmont Stakes winners, and 29 Breeder's Cup winners. 6 of the 12 Triple Crown winners were sired by Claiborne stallions. Among them was Secretariat, one of the greatest racehorses in American racing history, who stood here upon his the end of his racing career in 1973 until his death in 1989. Today, stallions that stand at Claiborne include 2013 Kentucky Derby winner Orb, and one of the top international sires War Front, who fetches a $250,000 stud fee, the second highest in the country. We got to meet both of those horses, as well as feed mints to a couple other stallions at the farm. 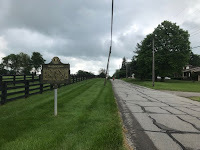 The tour ended in the cemetery that sits behind the visitors center, which is the final resting place for several famous horses, including Secretariat. Pretzels and beer cheese. 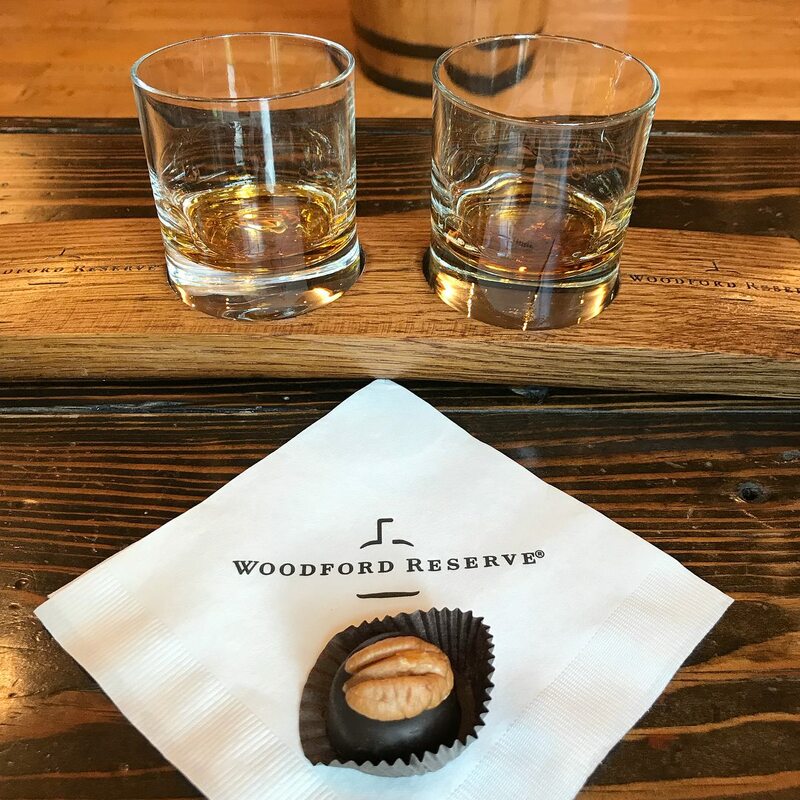 A KY fave! The rest of the afternoon included more drinks; a stop at Ethereal Brewing, where I got to sample their "Loco Choco Coco,"a chocolate coconut porter, as well as some of THEIR beer cheese; and at Country Boy Brewing, where I got a glass of their Strawberry Gose. Country Boy was hosting the 5th Annual Beer Cheese Contest, but ended up hosting it at their Georgetown taproom, a half hour away; I decided to just stick around downtown Lexington and enjoy a beer at that location before grabbing brunch at a locally recommended brunch joint, County Club, before heading to the airport to rest up before my flights home. It was a long afternoon and evening of travel, with weather affecting flights in and out of Atlanta all day, but I made it home in one piece, ready for another week of work before more travel ahead!